[UPDATED APRIL 2017] To prepare you for the next tax year end, I thought I’d pen a special feature that uncovers which investment type benefits the most from a Tax Free Savings Account (TFSA). Remember that your last chance to top up your TFSA before the new tax year will be 28 February 2018. 1) Every tax year (1 March - 28 February), an individual is permitted to make deposits to the total value of R33,000. Should the allocation not be used, there is no carrying over allowance. Also, if a withdrawal is made on the TFSA, one is not permitted to make up the allocation thereafter. Takeaway: Don’t use this account as a transactional account. In order to get full benefit from the TFSA, treat it like a retirement investment - don’t dip into it! 2) The contribution limit over a lifetime was set at R500,000 which means that the quickest it would take to reach this threshold through the maximum contribution per year is 16 years and 1 day (as the final allocation could be made on the first day of the new tax year - 1 March of the 17th tax period). Takeaway: Try to make use of the allocation every year in order to maximise the compounding effect on the TFSA. * To qualify, no ETF or unit trust can have more than 10% exposure in any one holding. Takeaway: Note that individual shares, individual REITs, ETNs, commodity ETFs, derivatives and geared instruments are not permitted. Also bear in mind that while a retirement annuity (RA) for example is governed by Regulation 28 (of the Pension Funds Act) in respect to limiting international investment exposure to only 25% of the portfolio, the TFSA has no such limit. It can therefore be used advantageously to add offshore exposure in hard currency to one’s portfolio. Estate duty upon your death is effectively the only tax that can be applied. Given the above tax savings on offer, let’s begin working through the three main asset classes (interest bearing investments, equities and property through REITs) that one can put into a TFSA to derive maximum tax benefit. Let’s start with fixed deposits or other interest-bearing investments. In the majority of instances, it is of no benefit to include these in a TFSA. While moves have been made to abolish the annual interest income exemption, it has since been decided to keep the exemption in place. Currently the first R23 800 of interest income earned per tax year for individuals below 65 years of age, and R34 500 for individuals above 65, is tax free. This exemption is available to every individual and does not need to be placed in a TFSA to qualify. Therefore until a client is generating annual income from interest in excess of the thresholds stated above, there is absolutely no need to house the interest-bearing investment in a TFSA. To illustrate how long it would take for a fixed deposit investment to benefit from being housed in a TFSA, I took a real-life example from Absa and ran the numbers. Absa offers a tiered interest rate matched to the value of the total investment in the TFSA. This maxes out at a paltry 6.5% annual interest rate for values over R30,000. Given that inflation hovers around the same rate, the real return is contemptible. What’s worse is that it would take somebody under the age of 65 around 9 years to contribute enough to this type of TFSA (including reinvestment of interest earned), before it would generate R23,800 in earnings and actually derive a tax benefit for every cent earned thereafter. An individual over the age of 65 would need around 12 years to hit the threshold of R34,500. Up until then, fixed deposits would simply be using up valuable space that could have otherwise been occupied by equities or REITs. Both these asset classes benefit from the first cent of returns due to the favourable tax-free nature of a TFSA. Product providers offering fixed deposits in a TFSA don’t seem to be supplying this paragraph of information in their marketing materials, and I believe they should be required to. Investors are being won over by marketing - and research conducted by Sanlam Personal Finance confirms this. They found that 60% of TFSA owners surveyed in the study had invested in a cash deposit account, which is troubling. The REIT allocation of one’s total portfolio should be channelled into a TFSA. The key reason for this stems from the way a REIT is treated for tax purposes. A REIT can effectively achieve a zero tax rate at corporation level (and many REITs the world over do) should they distribute all of their taxable earnings to shareholders. In South Africa, REITs are required to distribute at least 75% and in the US, the figure is a whopping 90% minimum. REITs are incentivised to do so as the tax penalty and subsequent loss of REIT status would be a terrible consequence for the company. Furthermore, REITs are exempt from paying Dividend Withholding Tax (DWT) and distributions are therefore taxed in the hands of the shareholders at their respective marginal income tax rate. Now consider that this may be as much as 41% for top earners. If this investment is then housed in a TFSA, the 41% on distributions as well as Capital Gains Tax (CGT) on eventual withdrawals is waived. This makes a REIT investment, owing to its special tax structure, the only available vehicle that (in a TFSA wrapper) can benefit from no tax at corporate level (whereas equities like Sasol, Steinhoff and Standard Bank are still liable for a corporate tax bill), no tax at dividend/distribution level, and again no tax at income tax and CGT level. 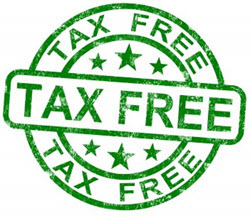 It is tax free from start to finish: from receiving the tenants’ rental, to paying it over to the REIT shareholders. There are several REIT ETFs available for purposes of investing in a TFSA, but there are also REIT unit trusts as well. Some come with enviable track records that have their investments in global listed REITs, thereby adding a Rand hedge as well as regional and sectoral diversification to a portfolio. Here is a list of the available JSE property ETFs as well as South African fund managers with a specialist global property unit trust option accessible via ZAR, and which have at least a 5-year track record. As a final word, do consult with a reputable and suitably qualified Financial Advisor before making any investment decisions, as there certainly are contexts that would deserve different treatment to the scenarios outlined here. Catch me next week for another property-focused instalment.